We’re all familiar with the never-ending debate of games being art. Are they, are they not? Plenty of arguments for, plenty against and usually certain titles get thrown around like The Journey, Metal Gear Solid, the recent NieR: Automata and so on. And on the far end, we have some games staying away from all that drama. They’re created in mind so we can mostly wreak havoc, drive around super fast or just blow stuff up. Just Cause series did a fine job on that last bit. There is usually some half-interesting story about saving the world or whatever as an excuse for all the destruction and we’re good to go. 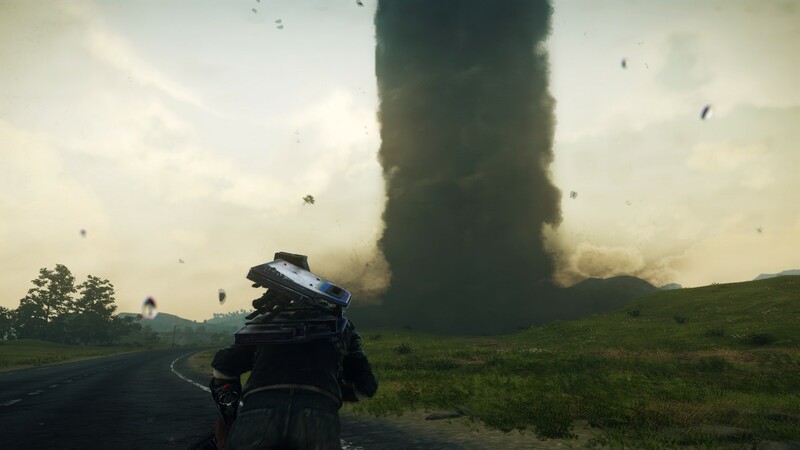 I finished recently Just Cause 3 and this sequel promised some neat new stuff like a weather system, different biomes, and more gadgets to create destruction. Why? Well, just cause (terrible, terrible joke…first and last one in this review, I promise). We find our favorite agent and stuntman, Rico Rodriguez, in a fictional South American country called Solís. Rico continues waging a personal war against the Black Hand, a powerful private army. Only this time we have a face (or better yet, a leader) behind the army. Gabriella Morales is a newly introduced character in Just Cause 4 and the main antagonist of the game. To make things worse (or interesting, depending on how you look at it), Rico soon discovers that his late father was working with the Black Hand! How, why and most importantly – was he paid well? They don’t answer that last question in the game but we can definitely find some answers regarding the first two. So the basic story to give some sense to all that mindless destruction is there, now let’s get onto the more important bits. In short: some things were added, some removed. Some good, some bad. The grappling hook has been upgraded and we can add mods to it. Along with tethering objects (or people) to one another, this time we can have a hook that ends up with a booster. Attach that to a parked car or a person and see them fly sky high. There is also a helium balloon as a hook finish, use that to lift pretty much anything up (mostly confused enemies). We can fine-tune all these mods, adjusting how the balloons and boosters act (do they blow up or pop once they reach a certain height). Some new weapons are in the game but I’m not a fan of how extremely limited ammo capacity they all have. Expect to kill no more than a dozen of enemies, give or take, before you have to zip around and search for a nearby weapon crate. Good old destruction is still with us although with minor adjustments. Unnecessary and unwelcome adjustments. Remember how in previous games you had to blow up & destroy various locations in order to liberate areas and progress through the game? Well, this time you also get chaos points for blowing stuff up and upon reaching a certain level of chaos, you are awarded an army squad. You use a squad to liberate a small portion of the area on the map. So no more 100%ing a certain region to fully liberate it, just mindlessly blow stuff up and it will happen pretty soon. But how do you know if you ever 100% a location or destroy everything? Well, you don’t. Believe it or not, all destructible objects spawn right back after some time. 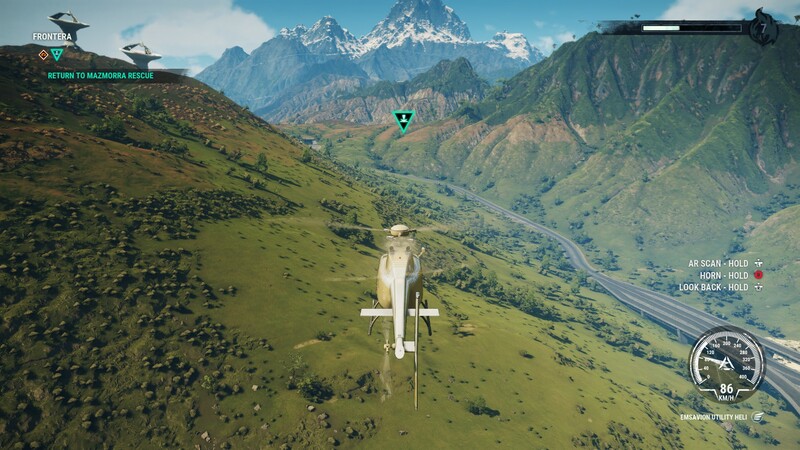 Speaking of the map, Just Cause 4 has the worst UI of all the game in the series. There is a map screen, a separate screen for grapple hook mods, screen for challenges and one to manage supply drops and pilots (used for fast travel). The whole map screen is also incredibly close to you and you have to scroll through it quite a bit to see everything. You also can’t remap some keys and game progression is repetitive as hell. 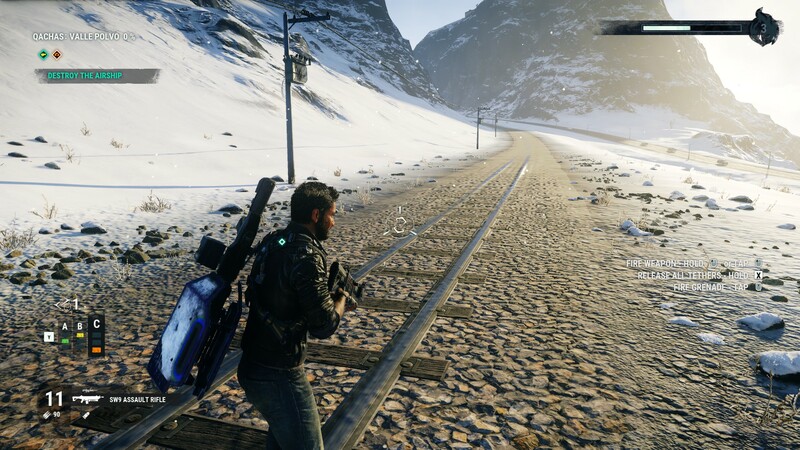 Doing some repetition in side missions is expected to a degree, but Just Cause 4 really pushes it. There is a character called Garland King and she tasks you with doing plenty of stunts for her upcoming movies. The stunts are divided into three sections; pass through a ring driving a certain car, drive through a ring at high speed and fly with a wingsuit through three rings. That’s all. Now repeat it around a hundred times. Lazy and uninspiring as hell. If I were unimpressed with gameplay, then this section is straight up disappointing. I have a brand new rig (recently upgraded) and some visuals are mindbogglingly bad. Upon my first play, I noticed a strange shadow effect, like everything is coated in three layers of pixelated darkness. After some lurking in Just Cause 4 discussions on Steam, I saw someone advising others to turn off SSAO in options to fix it. And what do you know, it worked. The first time that I had to tone down some visuals for a game to look better. The water is also strangely still, no waves whatsoever and I stumbled upon some strange texture of train tracks literally pasted on the ground. Just all flat, like a sticker. If you ever wondered how a PlayStation 2 game would look like in 2018, here is your answer. The audio is a big improvement over Just Cause 3, mainly because they added more of it during exploration. You don’t feel alone anymore while gliding with a wingsuit, sometimes a serene music track will kick in. But the biggest improvement this time is the inclusion of radio stations in vehicles. Considering that there are quite a few times where you have to drive from point A to point B in missions, this is a great addition. There are also some oddities during cutscenes, such as the speaking characters sounding like they’re way back in the background compared to where they actually are. You know how they say “if something is broken, don’t fix it”? 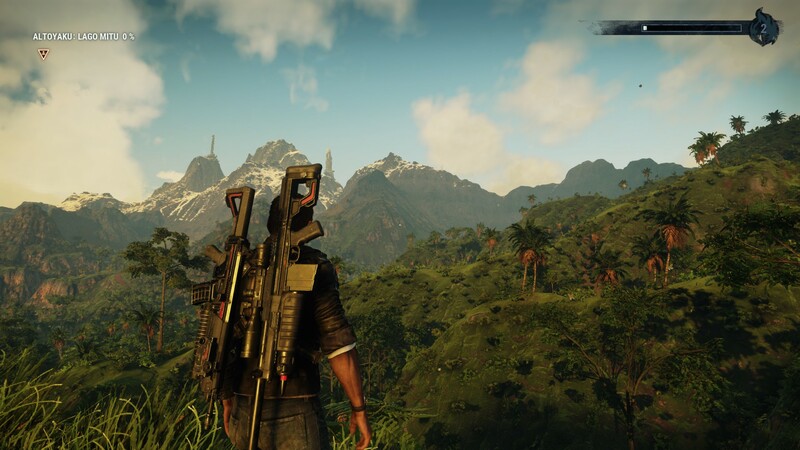 The more I think about (and play) Just Cause 4, a similar thing comes to mind. Don’t change stuff just for the sake of changing it. Ok, maybe after some time I could get used to that atrocious UI. What I can’t get over is the revamped progress system with respawning destructible locations. Why would I ever bother destroying a large and heavily guarded base for 20 minutes is everything is going to reappear from thin air an hour later? Add some visuals that are 5-6 years late to the party and we have a winning recipe – for a game to avoid. To be honest, I feel a bit sad writing all this. After I got my hands on the game, I thought to myself “well this should be fairly easy”. All I needed was more of the same, with new locations and weapons for good measure. Instead, I got more of the stuff nobody asked for with a plethora of technical issues for good measure. I’ve seen traffic going absolutely haywire, enemy ships launching me on the other side of the map, helicopters in kamikaze mode against me and everything else, camera view locking up with only a full game reboot being able to fix it and so on. 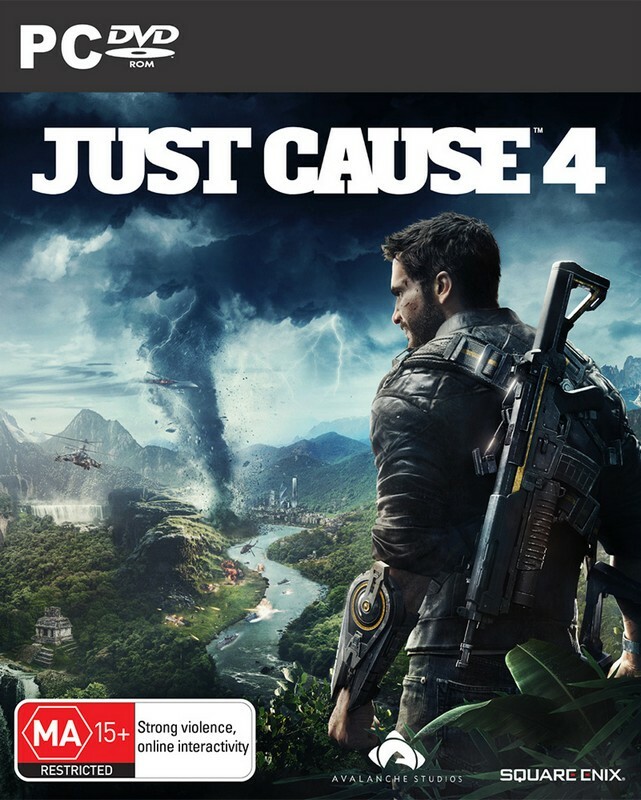 At this stage, with this price, these visuals and this many bugs, I cannot recommend Just Cause 4. If the previous review of HITMAN 2 was my GOTY of 2018, then this is my disappointment game of the year. My advice is to wait some months to patches and visual tweaks to see if anything can be salvaged from this debacle. A game with a lot of promise and not much else. Riddled with technical issues and visually underwhelming to the point of being barely playable.